This is a brief analysis of some issues in the U.N. Economic Commission for Latin America and the Caribbean (ECLAC) book La economía cubana: Reformas estructurales y desempeño en los noventa. A more comprehensive review of this book (dealing with different topics), is forthcoming in an issue of Cuban Studies to be published in 1999. I regret that a representative from ECLAC was not able to attend this session of the ASCE meetings and respond to my comments, but hope that an answer will be published in future proceedings. This is a very important book for at least four reasons. First, it fills a serious gap in Cuban statistics resulting from the halting of publication of the Anuario Estadístico de Cuba (AEC, the official statistical yearbook) after 1989. The Cuban National Bank (BNC) published, in 1995 and 1996, annual economic reports with statistics, but they have a small fraction of the data that appeared in the AEC; furthermore, the 1997 issue has been unavailable, perhaps due to the May 1997 bank reform that relegated the BNC to a secondary role and created Cuba’s Central Bank. The Ministry of Economics and Planning published a report in 1998 which, in turn, is considerably smaller than the BNC reports. ECLAC’s book provides 128 statistical tables and 35 graphs which constitute the most extensive collection of data available on Cuba for the 1990-96 period (a few include 1997). Although many of these tables are questionable (methodologically or factually), the same can be said of Cuban official statistics, a problem that has not impeded scholars to study, scrutinize and cautiously use them for four decades. Second, the book is not limited to publishing official data and includes ECLAC’s valuable estimates, never available before, in several important areas, e.g., on the labor force, open unemployment and underemployment, the cost of unemployment compensation, and so forth. Those of us that have worked on Cuba’s labor sector for many years faced the enormous vacuum of data on the EAP (which led to gross estimates with wide variations among them) and the estimates in the book are of great value although obviously will be the subject of future analysis. Third, a good part of the data and views in the book are favorable to Cuba (particularly after 1993), but many others show critical problems, for instance, the sharp decline in production in 1989-93 (and, in many areas, output levels in 1996-97 well below those of 1989), the deterioration in the caloric intake, the cut in half of the higher education enrollment in 1989-96, the enormous size of “equivalent unemployment” (i.e., open unemployment plus displaced workers receiving unemployment compensation) and so forth. Fourth, Cuba is a member of the United Nations and also affiliated with ECLAC, hence, the language of the book had to be much more diplomatic than that normally used by scholars. Furthermore, in my opinion, one objective of the book was to push the economic reform further in Cuba (a goal that has obviously failed, at least until August 1998) and, in order to do that, tried not to alienate the island’s authorities (which could have blocked the publication of the original report). But a careful reading of the book reveals many criticisms of current flaws and recommendations to correct them. I do agree with many of Rolando Castañeda’s specific criticisms detailed in his comments (although not in his overall evaluation) and add herein others. First, the report was written by a team of experts and, obviously, was not carefully checked by a skilled editor, thus resulting in contradictions. Some examples follow: (a) “in 1989 Cuba had virtually full employment” (p. 53), but the unemployment rate was “less than 4% in 1989” (p. 36), and 7.9% in the same year (Table III-20); (b) the daily per capita caloric intake was 2833 in 1992 (Table IV-22), but one year later suddenly dropped to 1863 (Table A.59); (c) the illiteracy rate was 4% in 1981 (p. 36) but 6% in the 1990s (Table A.58), and “currently  is 4%” (p. 371); and (d) the infant mortality rate was 60% in 1958 (p. 36) but the AEC 1972 (p. 22) gave it as 33% for the same year. Second, there are some significant gaps in the book or analysis which is factually incorrect. Two examples should suffice. The most glaring omission is the antimarket Rectification Process launched by Fidel Castro in 1986-90, which reversed the previous approach (the SDPE in 1975-85); there is an absolute lack of analysis of this serious economic error which makes it difficult to understand the recession caused by it. Exogenous factors, particularly the U.S. economic embargo, are blamed for the bad performance in this stage, but the embargo was not tightened until the Torricelli Law was enacted at the end of 1992 and, mainly, by the Helms-Burton Act of 1996. Third, the rest of this comment is devoted to analyze a significant incongruence between Cuba macroeconomic data and that published in the book, as well as differences between the latter and the most recent ECLAC study Cuba: Evolución económica durante 1997 (thereafter abbreviated as ECLAC 1998). Table 1 reproduces in its first column the official Cuban statistical series of GDP at constant (1981) pesos for 1985-97, based on the BNC, the Oficina Nacional de Estadística (ONE) and the Ministerio de Economía y Planificación (the rates and the index are my calculations). The second half of Table 1 reproduces the corresponding series from ECLAC, based on the book and estimates for the year 1997 from the growth rate published in the Balance Preliminar de la Economía de América Latina y el Caribe 1997 (I estimated the index). Until 1994, and with the exception of the year 1988, the ECLAC series shows higher growth rates than Cuba’s series; as a result, GDP in 1997 according to the former was 17.4% higher than the latter (17.1 vis-a-vis 14.6 billion pesos), and the respective indices for 1997 were 84.1 and 71.5, which means that the economic recovery in relation to the year base 1985 was 12.6 percentage points better according to ECLAC than Cuba. In spite of this significant difference, the book lacks a methodological explanation on how the ECLAC estimates of GDP were done, a most relevant issue because we totally ignore how Cuba did the conversion from GSP (material product system) to GDP (system of national accounts) for 1985-93 when both series are available. Furthermore, there are many unanswered questions on whether or not Cuba can accurately estimate GDP in view of the important informal sector of the economy. Finally, in spite of the long scholarly debate (ignored by the book) on the use of an abnormal year as a base for the series in constant prices (1981, faulty due to its high inflation and the way Cubans calculated it), and on its continued use for 17 years, ECLAC develops an apparent new series but keeps the dubious year base. Complicating this problem further, the ECLAC 1998 report on the Cuban economy reproduces not the book GDP series but the Cuban series for the entire period 1989-97. This puzzle raises even more questions: if a new methodology was indeed developed in the book to revise the official series, why then did ECLAC retrogress to the latter in its most recent publication? If a new methodology was not developed, why do the book series exhibit a much better economic performance than reported by Cuba, and how can such a difference be explained? Since 1988 Cuba has not published the GDP deflator, which is crucial to assess its economic growth in constant pesos. Table 2 presents my estimates of the implicit deflator (based on official data) and compares them with the implicit deflator calculated in the book, both for 1990-96. In addition, Table 2 contrasts the official and series contained in the book on the fiscal deficit as a percentage of GDP for 1989- 96, showing that the latter percentages are systematically lower than the former. Hence, ECLAC once again shows better economic performance than the Cuban data. This is an statistical illusion, however, the result of ECLAC using the same budget deficit in absolute figures as Cuba, but estimating GDP in current pesos considerably higher than Cuba (an annual average of 8% higher); as in other cases, the book lacks any explanation for such a difference. Furthermore, ECLAC 1998 reproduces the official fiscal deficit percentages, instead of those in the book, thus raising the same questions as before when we discussed GDP growth in constant pesos. 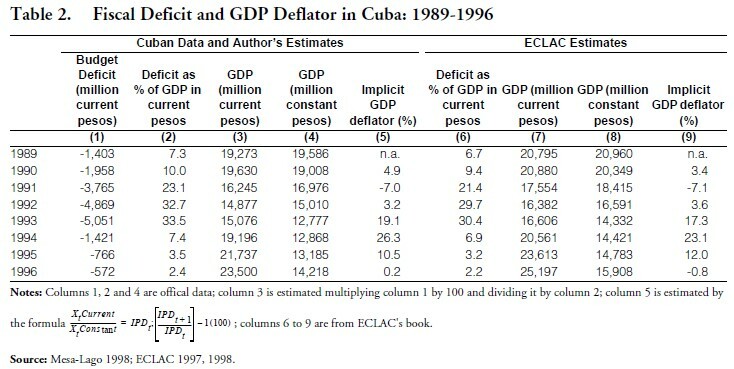 The comparison of the implicit GDP deflator for 1990-96 shows that in five of the years the deflator in the book was lower than Cuba’s, in one year it was the same, and in two years it was higher, once again indicating a better performance based on the ECLAC series than on the official series. A good part of the explanation is that both GDP in constant and current pesos are higher in the book than in the official series, but the relationship between the two is important also. Particularly troublesome is the year 1996, when my estimated deflator is 0.2% but the book is a negative 0.8%. Finally, ECLAC 1998 publishes, for the first time, inflation rates which are abnormally mismatched with the GDP deflator from the book, as follows: 12% and -11% (yes, it is negative!) in 1995 and 0.8% and -5% in 1996. The above analysis and questions are examples of those that scholars who work on the Cuban economy will be raising concerning the ECLAC book. Hopefully some of the presented puzzles and queries will be answered by ECLAC officials and contribute to a deeper analysis of the Cuban economy and more refined data to assess it. ________. 1998. Cuba: Evolución económica durante 1997. México: LC/MEX/L.352, July 15.